Sometimes the reason for a clog is pretty obvious…you make some ill advised attempt to shred potato peels in your garbage disposal and then suddenly the water doesn’t go down anymore. Put two and two together…the peels caused the clog. But it’s not always so obvious why your water sticks around like your slacker brother-in-law after the game. Sometimes it just stops working (like your brother-in-law…) So, we’re dealing with a clogged kitchen sink, which means a drain problem, right? Well, maybe not. Yep, it could be the sink: Like we said, it’s not so obvious what clogged your sink. Was it a foreign object the kids sent down? Was it some new food you sent down that started as a liquid but then solidified? Or maybe it’s was just a slow, slow buildup of grease that finally caught that match stick that accidently fell down the drain and now won’t let anything past. 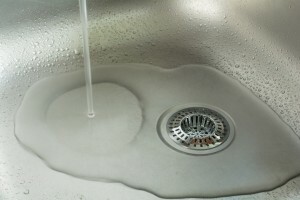 Time to call Garvin’s for drain cleaning. Nope, it’s your sewer: So the sink stops, and a simple plunger just isn’t taking care of it…or if it doesn’t, the clog’s back the next day. Then you start noticing that the toilet starts to go slower, swirling a lot more than usual. And now that you think of it, your feet were prunier than usual last night…were they in standing water in the shower last night? If all of your drains are running slow, you’ve probably got a sewer clog and it’s time to call Garvin’s for sewer cleaning. Either way, if the basics of using a plunger aren’t taking care of our problem, it’s time for some Garvin’s in your life. Contact us when you’re in sewer trouble.